· Headless Function: You do not need to first find out which direction it flies to avoid collisions. 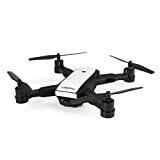 · 720P HD Camera: Can be rotated up and down by the transmitter and can take photos, record videos and stream in real time through the camera image of the phone. · GPS Positioning: When you are flying outdoors, the aircraft will automatically search for the satellite signal, allowing you to scroll more accurately, perform the follow me function, travel point flight, one-key return, etc. It also allows you to make a low voltage return, return function out of control that protects the drone from losses. · Follow me: the UAV keeps recording you every moment at a certain distance.